How Much Compensation Can I Claim For A Zara Accident? ZARA Accident Claims For Compensation, What Could I Claim? In this guide, we will look at ZARA accident claims, as well as the responsibilities of the shop and what customers may be able to claim in compensation for injuries in the store. Any retail business in the UK, such as the clothing chain ZARA, are required to follow health and safety legislation, having all the relevant health and safety measures in place to protect both the general public and their employees as well as visitors on their premises. Retail stores (as a business) and their owners and managers need to ensure that they and their staff are hazard aware. They also need to ensure that they are taking all the steps reasonable to prevent accidents and injuries happening on their premises. 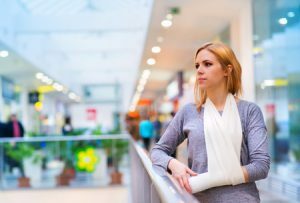 If the shop fails in this duty of care, or if they are in some way negligent in carrying out appropriate steps, customers, staff or visitors to the store who are injured may be able to make a compensation claim. Shops such as ZARA may often be located in a shopping centre or mall or in rented premises. As such, responsibility for the maintenance of the property, and liability, could be split. Read on to find out more about the best way to make ZARA accident claims, as well as what they can include. If you have been injured as a customer, member of staff or visitor to a ZARA store in the UK, and the accident was not your fault, you could have the basis for making a personal injury claim. Whether you work for ZARA or are an agency worker or a member of the public browsing and shopping in ZARA, you could well make a claim against the fashion retailer. There are numerous types of accidents which can occur in retail and fashion stores such as ZARA. Claims can be brought for accidents which happen both on the shop floor, in employee areas, and in storage areas. There are numerous types of accidents which can occur in retail stores which can be down to procedure, lack of maintenance or simply negligence of the relevant health and safety rules. The specialist legal solicitors we work with at Legal Expert have years of experience in dealing with retail compensation claims, such as making a ZARA injury claim. We will help you get the full compensation award you deserve. In this guide, we will take you through some of the most common causes of accidents in shops and stores, as well as common injury types people sustain and how to go about making shopping accident claims. We will also take you through claimants eligibility and the average payout amounts for different injuries. Exposure to loud noises causing hearing loss. Assaults or fights in the workplace. The severity of injuries sustained can vary significantly, from minor scrapes, bruises, and strains to severe sickness or total loss of hearing. The more serious an injury, the more they may suffer and the greater the potential compensation award. As well as the accident above, employee injuries can also be caused by shelving and racking accidents in storage areas. Previous cases of ZARA accident claims have included shoppers falling over and suffering a variety of different injuries, such as a shopper who fell over in a different store. She significantly injured her shoulder and successfully made a claim for £50,000 in total compensation. If you have suffered an injury as a result of an injury which was not your fault, working or shopping ZARA, please don’t hesitate to contact Legal Expert. Our expert legal solicitors will work to get you the maximum amount of general and special damages they can. Whether you are an employee of ZARA or are a customer in the store, if you have suffered an injury as a result of a slip, trip, or fall which was not your fault, you may be able to make a ZARA slip, trip, or fall claim for compensation. Slips, trips, and falls in a ZARA store could be caused by items being left around the store for people to fall over. They can also be caused by floors being left wet after they are cleaned (either by ZARA employees or third party cleaners). They can also be caused by staff spill liquids. If staff have been notified of a spill, or a blockage which could cause a trip or fall and fail to either clear it up or to place a sign to notify people, the store could be liable for negligence and responsible for any injuries sustained. It is the responsibility of every employer to put in place the measures necessary to protect their staff. Employers also have a responsibility to inform staff of any health and safety issues which could affect them. Employers also have a responsibility to inform their staff of the best way to carry out tasks and to train them to correctly carry out their duties in a safe way, without injury. For many workplaces, such as retail stores, this duty of care also extends to customers and anyone else who may be on the premises. ZARA stores and managers should carry out the correct risk assessments to ensure that all jobs can be carried out in a safe way. Employees also have a responsibility to protect themselves from unnecessary accidents as well. If you have been injured in the workplace, one of the questions you may be asking is, will you get paid for any time off. In most cases, you will have the right to sick pay if you have sustained an accident at work. Across the retail sector in the UK, there are around 2,250 injuries per 100,000 retail employees, according to statistics produced by the HSE. The most common workplace accidents are slips, trips, and falls as well as muscle strains, RSI injuries and either crashes or injuries sustained as a result of being hit by a falling object. These are all common accidents which could lead a claimant to need to make a ZARA injury claim. To help prevent accidents in shops and stores, the Health and Safety Executive (HSE) has produced shop risk assessment tools and guidelines to be followed. These tools allow retailers to perform risk assessments easily and quickly. They enable retailers to create a tailored assessment of their shop space by selecting the relevant hazards that may occur in their retail space. It will provide some guidance as to how to control hazards which are identified. There is a time limit of three years within which it makes a claim. This kicks in either from the date of the accident, or the date of the discovery of the injury. At Legal Expert, we can offer a no win no fee service to help you make a workplace accident claim. Employees of a ZARA store should have undergone the correct health and safety training to carry out their duties. If they have not had this training, it could be considered a breach in their duty of care. Employees and employers have a responsibility to do all they an to prevent accidents in the workplace occurring. The retailer should provide employees adequate resources to make sure the shop is a safe working environment. All shops should regularly update and check their own health and safety procedures and rules. All employees should be continually updated about the relevant health and safety as well as fire safety practices. Storage and racking accidents include two major types of accidents. Firstly manual handling accidents and secondly, accidents where the injury was caused by a collapsing or dangerous shelving or racking systems. These can be caused by incorrectly stored or stacked on shelving. Manual handling accidents will typically occur when an employee is loading or unloading items from storage racking or display shelving. The second category is where the injury was caused by racking or shelving which was either dangerous or was collapsing. In retailers, these accidents can happen to customers. And employees as well as other, similar establishments. Shelving and racking accidents can be caused by a wide variety of different factors. Racking and shelving form the basis for storing retail goods. For more information on storage and racking accidents and shopping accident claims, view our guide to storage and racking accidents. Report the accident to ZARA and ensure it is correctly logged in their accident reporting book. Ask for a copy of the log. Keep this and pass it on to your solicitors. Gather any witness statements or contact details. Your lawyer will be able to get a detailed statement from them to verify (some of) the details of your claim. Take as many photos of the accident as well as your injuries as you can. Make sure to photograph the whole site of the accident. See a doctor (such as your GP, hospital or specialist) to have your injuries assessed as soon as possible after your accident. This is important to ensure you get all the medical treatment you need, as well as establishing the extent of your injuries. This will also help determine the level of compensation you could be entitled to. Keep a log of any expenses you incur as a result of your injuries. This could include things such as prescription or other medical costs, travel expenses or the costs of any adaptations to your home or vehicle. It can also include loss of earnings and pension contributions. Make a note of the whole incident as soon as possible. This helps you to have as clear a recollection as possible and ensure details are not forgotten later. If you need to make a ZARA accident claim, we can help you to do so. All you will need to do is to contact Legal Expert and we will begin work on your shopping accident claims. We work with a panel of highly experienced personal injury lawyers across the country, specialising in personal injury claims, such as ZARA injury compensation claims. During our initial consultation with you, we will provide you with information on the process of making a personal injury claim, such as a ZARA accident claim. We will also ask you some question to help establish the basis of your claim and the case we could build. Once we have put together all the details we need to start building your case, our next step will be to proceed with making your compensation claim under a no win no fee Conditional Fee Agreement. The agreement means that you won’t have to pay anything unless you make a successful claim. One of the most common questions which solicitors are asked is how much compensation they can expect to receive for a personal injury claim. However, at the start of the claims process, it is not possible to estimate the level of compensation for an accident in ZARA that a person may be entitled to. The table below looks at several different types and severities of injury, as well as the award banding for that injury type. Loss of earnings Potential award banding £10,000 - £400,000 Awards for loss of earnings are based on the claimants current salary/ wages and their (potential) future earnings. Payouts are calculated by taking claimants future prospects and current pay grade into account. . Pain and suffering Mild to Severe £1,000 - £200,000 Severity refers to the level of pain and suffering the client experiences. This helps to determine how much the claimant will receive. Knee injury Minor £4,750 - £19,600 Minor damage to the knee (joint) which causes some pain and loss of function. Knee injury Moderate £22,250 - £33,200 Moderate damage which causes on going pain as well as loss of function of the knee for some time. Elbow injury Minor £3,100 - £9,750 Minor loss of function and/or pain in the joint. Elbow injury Moderate £11,400 - £23,900 Claims can include a partial loss of function of the elbow joint, and/or pain. Shoulder injury Minor £350 - £6,700 Restricting armmovements for the short term. Shoulder injury Moderate £6,250 - £9,750 Limiting arm movements. Back injury Minor £350 - £9,850 Temporary damage to the back and/ or some back pain. Back injury Moderate £8,750 - 30,750 More serious damage to the back as well as longer term ongoing pain. Minor injuries Minor Few hundred pounds - £525 Recovery from within 7 days. Minor injuries Minor £525 - £1,050 Recovery from within 28 days. Minor injuries Minor £1,050 - £1,860 Recovery from within 3 months. This table does not contain an exhaustive list of injuries which may be included in a ZARA accident claim. If your injury is not listed in this table, don’t panic as you will probably still be able to make a claim. Contact the specialist legal solicitors at Legal Expert. We can provide further advice on what your claim could be worth. The figures in the table above are based on the Judicial College guidelines for compensation claims in 2017. ZARA no win no fee accidents claims can be carried out under what is called a conditional fee agreement. A no win no fee agreement means that the solicitors we work with do not charge any ongoing or upfront charges. The solicitors will work to recover the compensation you are owed, without you having to pay beforehand. The benefit to claimants is that financial pressures are relieved and that the contract will set out in detail the work they can expect their solicitor to carry out on their behalf. If your claim is successful, the solicitors’ fee will be deducted from your claims award. The contract will specify this amount. If unsuccessful, the solicitors will not make any charges for their services. This will be stipulated in your contract. Previously, claimants have been concerned as to how much of their award they may have to pay to the solicitors, thinking that they might have to give over the bulk of it. By low, however, the claimant must be left with at least 75% of the total claims award. To start your case, speak to the specialist solicitors at Legal Expert today by calling 0800 073 8804. Making a personal injury compensation claim can be a difficult and lengthy process. To help you through this, you need the best experts you can find. At Legal Expert, our professional team is there to help you through the claims process, assisting you on the road to recovery and getting your the compensation you deserve. The solicitors we work with have decades of experience in personal injury claims and will try to make the process as pain-free as possible. The first step in making a personal injury claim is securing the best legal advice you can. Our services are always provided on a no win no fee basis. We start with a no-obligation advice and consultation service in which we will explain how the claims process works, and how we can best help you. You can ask our experts any questions you may have about making a claim or legal terminology. We will also ask you questions about your accident and injuries, as well as how it has all affected your life since. We might also ask about the financial costs you have faced as a direct result of the accident. After this, we may be able to offer our unique services to you. Claimants choose to work with the no win no fee solicitors at Legal Expert for a variety of reasons. Our panel of solicitors across the country are on hand seven days a week to help clients. By choosing Legal Expert, you can benefit from a wide array of expertise and experience. The solicitors we work with across the country can start reviewing your claim and the basic details of your accident as well as the injuries. From the beginning of the claims process to the resolution, our aim is to support you in your recovery. Our dedicated professionals will secure the compensation you deserve. Contact the professionals at Legal Expert today. Our professional team will start getting you the compensation you are entitled to. You can contact us by filling in the contact form on this page or calling us today on 0800 073 8804, or send us your details in an email. Tools and action to improve supermarket’s smooth floors.